How to integrate mobile YouTube videos. Mobile YouTube® is an economical way to tie to video that will display on most handheld devices. Mobile YouTube® can be triggered from a 2D barcode or from a link in a mobile landing page. Both options are direct to content. 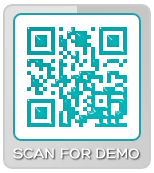 Scan the code to view an out take from QR Code documentary - SCANMAN™. Social Media, GeoLocation, Radio Tie-ins.